Vaccines are a powerful means by which certain diseases can be prevented. Many scientific studies demonstrate that they are both safe and effective, but unfortunately, there are those who have been convinced by misinformation produced by anti-vaccination groups. As a result, some infectious diseases are beginning to make a comeback in the United States. One of those diseases is measles. One reason measles is making a comeback in the United States is that there are several other parts of the world where measles has a stronghold. Since world travel is common, it is easy for someone to import the disease back to the U.S. In most cases, this isn’t a problem, because most travelers come into contact with people who have been vaccinated. As a result, the virus has a difficult time spreading, and the traveler is usually the only one who ends up suffering from the infection. Every once in a while, however, a traveler will come into contact with a group that has a very low vaccination rate. When that happens, the disease spreads quickly. For example, in April of 2013, an unvaccinated person returned home to North Carolina after spending three months in India. Along with souvenirs and stories, the traveler brought home the measles virus. Two other unvaccinated family members got the disease, and in the end, there were 23 confirmed cases of the measles. The vast majority of them (18) were among unvaccinated people. Two of the measles cases were in people of unknown vaccination status, and three were in people who were fully vaccinated. This, of course, brings up a very important point. When people refuse vaccination, they often think that the only possible consequences will be to them and their family, but that’s just not true. No medicine, including vaccines, is 100% effective. Thus, there will be a small percentage of people who get the vaccine but are not fully protected against the disease. When unvaccinated people provide a breeding and transmission population for the disease, this increases the risk to all people, even those who are vaccinated. Another example of such a measles outbreak occurred in late 2013. A traveler with an unknown vaccination history had visited Indonesia. Upon returning, the traveler went to a church in Texas in which the pastor had been critical of vaccinations. As a result, many of the members were not vaccinated against measles. In the end, 25 people were struck by the illness, and the vast majority of them were either unvaccinated or have no known vaccination history. Last year’s largest measles outbreak was the result of a similar story. In March of 2013, an unvaccinated teen returned to Brooklyn, NY from London. The traveler carried the measles back to an orthodox Jewish community that avoids vaccination. There were 58 identified cases of the measles that came as a result of this exposure, and all of them were in people who were either unvaccinated or had no known vaccination history. In this outbreak, one child got pneumonia as a complication, and two pregnant women had to be hospitalized. Unfortunately, one of those women miscarried. If you have been misled by anti-vaccine propaganda, please take the time to read from my collected articles on vaccination. Like all medicines, vaccines have side effects, and there are some people who should not get them. This is why you should consult with a physician who knows your family’s medical history before taking any medication. However, for the vast majority of people, the risk associated with not following the standard vaccination schedule is significantly higher than the risk associated with doing so. Dr. Wile — unrelated — have you seen this over at ICR’s site? I have, W. The problem is that amber is a really good way to preserve things – probably as good as ice. Thus, I don’t find this to be nearly as strong an argument against millions of years than the soft tissue found in petrified fossils. 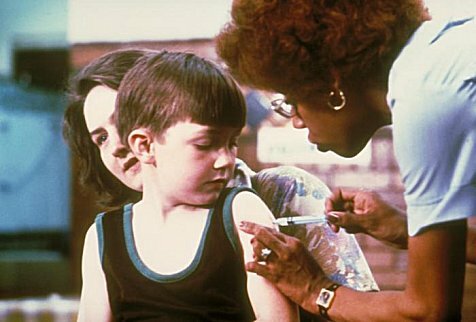 Are there risks in getting vaccinated (as an adult) after having NOT been vaccinated all your life? Excellent question, Kendall. I am not a healthcare professional, but based on my reading of the scientific literature, the vaccination needs of adults are different from the vaccination needs of children. For example, the Measles, Mumps, and Rubella shot is often not recommended to adults above 55. This is because the risk/benefit analysis of the vaccine is different for those ages than it is for younger people. However, the shingles vaccine is recommended only to those age 60 and older, as young people have a very low risk for shingles. It is best to discuss this with a physician who knows your medical history. how do you feel about the hpv vaccine for teen girls? That’s a good question, Cassandra. I would not give the vaccine to my girl for a couple of reasons. First, it is still very new. I tend to avoid new vaccines, because some side effects can come up in mass production that don’t show up in the clinical trials. This was the case, for example, with the old rotavirus vaccine. Second, the risk of HPV is very low in most teenage girls, especially those who are taught proper sexual morals. Thus, I don’t think the benefits of that vaccine outweigh the risks. Dr. Wile, what are your thought on how many vaccines are being put together? I don’t have any issie with vaccines as a methodology for preventing disease, I simply don’t care for the pace which Doctors prescribe them. In many cases Doctors follow the insurance guidance instead of the AAP and WHO guidance (personal experience). That has always been my concern. Showed that a mild illness at the time of vaccination does not affect the levels of antibodies produced by vaccination, which indicates that the vaccines don’t overwhelm the immune system. In addition, when you compare children who are given just one vaccine to children who are given several, there is no difference between the levels of antibodies produced. Once again, this seems to indicate there is no undue stress on the immune system. showed that children who received vaccination against diphtheria, pertussis, tetanus, HiB and poliomyelitis simultaneously within the third month have lower cases of non-vaccine-related infections than those who get fewer vaccinations during the same time period. This seems to indicate that the children who get all those shots at once end up having a stronger general immune system. However, if a parent is more comfortable spreading the vaccines apart, he or she should do that. The parent needs to be comfortable with the child’s healthcare! Thanks for your question, Mel. There are a few vaccines that are grown on cells that were taken from two abortions that occurred more than 40 years ago. Those cells are self-perpetuating, however, so there is no need for ongoing abortions to continue to make the vaccines. This is why most pro-life organizations support the use of those vaccines. I wrote an article about this a while ago. You can read it here. Dr. Wile, Thanks for a rational and scientific presentation regarding vaccines. As a physician, now writing Christian fiction, I absolutely gnash my teeth when fellow writers say they won’t accept immunization for any of the numerous diseases the vaccines for which are made from the tissue culture stemming from those two abortions five decades ago. When my first wife died over a decade ago, I didn’t like it–I was as opposed to her death as I am to abortion–but my dislike didn’t stop me from acceding to her wishes and allowing organ and tissue donation. Let some good come from even the worst situation. And that’s what’s happened with these vaccines.